Inspiring and engaging key notes, half day and multiple day programs that are timely, informative, motivational & relevant to the real challenges facing today’s business, association, government and general public audiences. 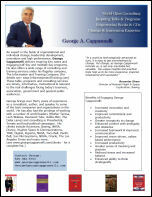 Audience Leaders, managers, and professionals in both the private and public sectors. Customized versions are available for OD and HR staffs, engineers, science and technical teams, sales staffs and a wide range of associations, private clubs and general public audiences. Unique Features A unique blend of information, audience interaction, Q&A and inspiring visuals and case studies. The half day and multiple day programs are highly experiential. Audiences leave well-informed and motivated and with practical tools and unique insights they can put to work immediately. Client Industries George’s clients span the gamut from aerospace to publishing, from consumer product and service industries to entertainment, high tech, travel, insurance, healthcare, manufacturing, sales, real estate and more. They range from multi-national conglomerates to start ups, include for profit and non-profit, national associations and hundreds of thousands of people in the general public.